Who needs to file a 1065? If you’ve recently entered into a business partnership, you may have heard about the form for declaring partnership income, IRS Form 1065. What is Form 1065? Who needs to file one? And what information do you need to complete it? Tax Form 1065, also known as a “Partnership Tax Return,” is how business partnerships report their financial information to the IRS. No taxes are paid from Form 1065. Like sole proprietorships, partnerships are “pass-through” entities, meaning their profits and losses pass through directly to their owners. There are two major steps involved in reporting taxes this way. First, the partnership reports total net income and all other relevant financial information for the partnership using Form 1065. Second, each individual partner then prepares their own personal Schedule K-1, which identifies each partner’s allocated profits and losses over the course of the reporting period. Each partner’s Schedule K-1 becomes part of their personal tax return. All partnerships in the United States must submit one IRS Form 1065. The IRS defines a “partnership” as any relationship existing between two or more persons who join to carry on a trade or business. A partnership is not a corporation. Unlike a corporation, a partnership is not a separate legal entity from the individual owners. Not sure if your business is a partnership? Most partnerships are spelled out in a formal written agreement called a partnership agreement, and are registered in the state in which they do business. Your partnership agreement might say you’re a general partnership, a limited partnership, or a limited liability partnership. If your company is an LLC and has not decided to be taxed as a corporation this year, then you will file taxes as a partnership and you must submit a 1065. Foreign partnerships with more than $20,000 annual income in the United States, or those who earn more than 1% of their income in the United States, must file Form 1065. To file Form 1065, you’ll need all of your partnership’s important year-end financial statements, including a profit and loss statement that shows net income and revenues, a list of all the partnership’s deductible expenses, and a balance sheet for the beginning and end of the year. If your business sells physical goods, you’ll need to provide information for calculating cost of good sold. You’ll also need to provide your Employer Identification Number (also known as your Tax ID), your Business Code Number, the number of partners in your business, start dates for the business, and information about whether your company uses the cash or accrual method of accounting. If any portion of profits were paid out to owners beyond their standard salary, or if you paid anyone outside the partnership more than $600 to do contract work and filed a Form 1099, you’ll have to report this information on your 1065 as well. The easiest way to file a 1065 is to use an online filing service that supports Form 1065. Most popular online tax filing services like H&R Block, TurboTax, and TaxAct offer support for filing Form 1065. If you’re looking to compare a few options, here’s a complete list of IRS-approved e-filing services. If you’d like to file by mail, make sure you send it to the correct IRS center address for your state. 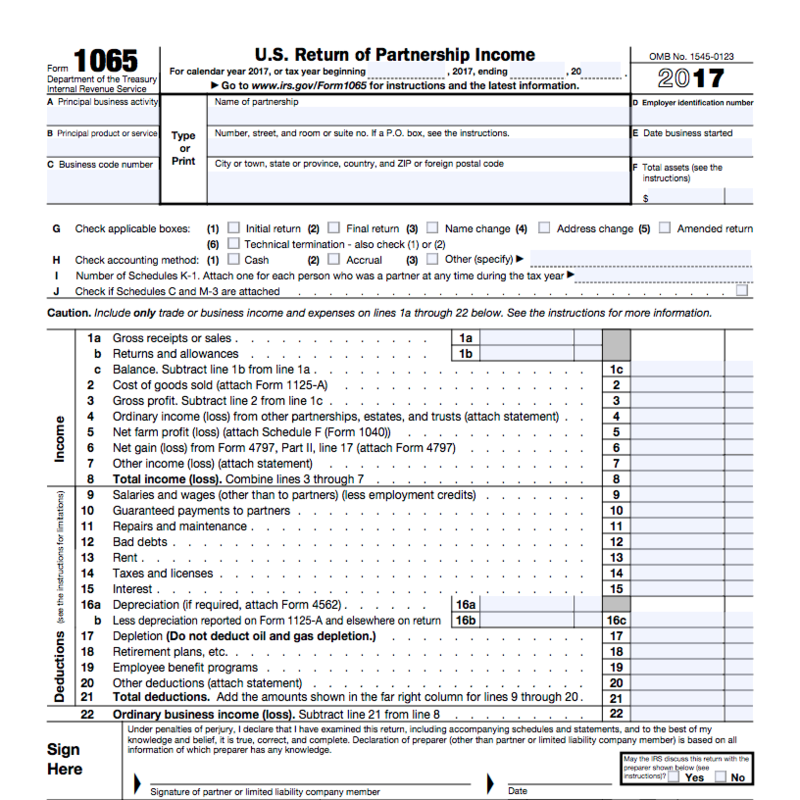 Form 1065 won’t help you calculate how much tax your partnerships owes. Instead, income, losses, dividends, and capital gains are assigned directly to partners using Schedule K-1. Each partner must file a Schedule K-1 separately, and items reported on it are assigned to each individual partner’s personal tax return. Most of the information you’ll need to complete your Schedule K-1 will come from the Income and Expenses section of Form 1065. Beyond ordinary business income (or losses), Schedule K-1 also captures real estate income, bond interest, royalties and dividends, capital gains, foreign transactions, and any other guaranteed payments that you might have received as part of your involvement in the partnership. Schedule L is a balance sheet, detailing all of your business’s assets, liabilities and capital, and is designed to keep the IRS appraised about the financial state of your partnership. If the answer to all four questions in part 6 of Schedule B on Form 1065 is “Yes,” then you don’t have to fill out Schedule L, Schedule M-2, or Schedule M-3. If your partnership does not meet all four requirements in part 6 of Schedule B—for example, if your partnership’s total annual receipts are more than $250,000 or its assets are more than $1 million—then you must fill out Schedules L, M-1, and M-2. All three of these schedules are located on page 5 of your 1065. Any changes in the balance sheet over the reporting period should be consistent with the information you provide about income and capital accounts on Schedules M-1 and M-2, respectively. Because the IRS often tallies things up differently from the average partnership, it’s normal for there to be a discrepancy between what a partnership records as its net income on its books vs. what the IRS recognizes as actual taxable profits. Schedule M-1 reconciles these differences by asking you about any income, expenses, and depreciation recorded on your books that you didn’t include in your tax return. Even if there are no differences between book income and reported income, a partnership that does not meet all four requirements in part 6 of Schedule B must file Schedule M-1. The purpose of Schedule M-2 is to inform the IRS of any changes to you or your partner’s capital accounts in the form of cash, property or any other capital contributions. Schedules L and M-1 contain items that will have to match items on M-2, so make sure to fill those out first before filling out M-2. For 2018 returns, Form 1065 must be filed by March 15, 2019, unless you file for a 6-month extension, making your new deadline September 16. You can file for an extension using Form 7004.